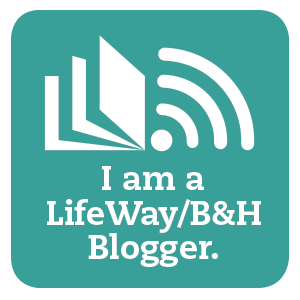 A few months ago, along the stream of linky parties, I stumbled upon a wonderful post about scripture journaling by Kathryn Ross at The Writer's Reverie. I was inspired to comment and what followed took me by surprise: a few email conversations and then I was invited to join the launch team of her freshly published book, Mother Chicken's Eggs. I'm so glad we found each other! It took more than a month to get to my review since shortly after accepting the opportunity we were kept down with family illness and then processing my step mom passing away. This book was the perfect close to this rough season. 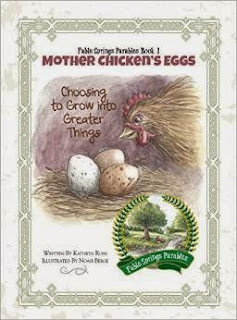 Intended for children but enjoyable by all ages, Mother Chicken's Eggs is a charming parable of challenges, overcoming, and growing into great things. We get to peek in and watch as Mother Chicken hatches her eggs and see how well her little chicks come about. Set on Old MacDonald's farm, the story is original yet nostalgic. The illustrations are absolutely charming, somewhat reminiscent of Beatrix Potter and just as captivating. I found myself pouring over the map at the opening of the book and dreaming of walking down the lane, waving to neighbors and visiting the farm where Mother Chicken lived! The story of Mother Chicken and her hatchlings has a rhyme interlude between each 'scene' which is fun and engaging even for the smallest of listeners. If the anticipation of the story line doesn't capture their attention, the illustrations will. Older children can enjoy this book as well for it's suspenseful progression of events carefully crafted to lead to the final lesson. Mrs. Ross is an expert story teller and her years of experience and passion show through. She even includes a study guide for use in church group or with your child(ren). I received the e-book version but I am going to order a hard copy to keep handy for when the good Lord blesses me with grandchildren! I look forward to sharing this with them. Other materials have been developed; an audio version, original prints of the illustrations and music CDs. Mrs. Ross is also planning more wonderful stories in the Parable Springs series. 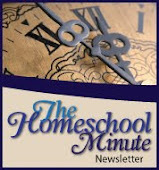 To learn more you can visit Mrs. Ross at Pageant Wagon Publishing. Blessings for happy hours of reading! * This book review is my opinion alone. Kathryn Ross provided this book free of charge in exchange for my honest opinion.